Valparaíso – The paradise valley? … maybe! For us, not so much, but we heard, that it used to be quite a great place for love-hungry sailors back in the day – maybe that’s where the name comes from! As you may have noticed by now, we were not the biggest fans of Valparaíso. But to be fair, it has its nice areas: The colorful houses of the UNESCO protected old town are charming and some pleasant time can be spent in roof top cafes and bars, overviewing, well, the “beautiful” port of Valparaíso. Some beers probably would help to increase the city’s flair, however, make sure not to just buy some cans of beer and drink them on the streets – that could earn you a substantial fine as drinking in public is a felony unless its New Years Eve or the major national holiday. We enjoyed the free walking tour through the town as our guide was able to point out some interesting details about the city’s history. For instance, that prostitution used to be a major business in the city which can be recognized by the meaningful names of some neighborhoods like happy and pleasure hill. 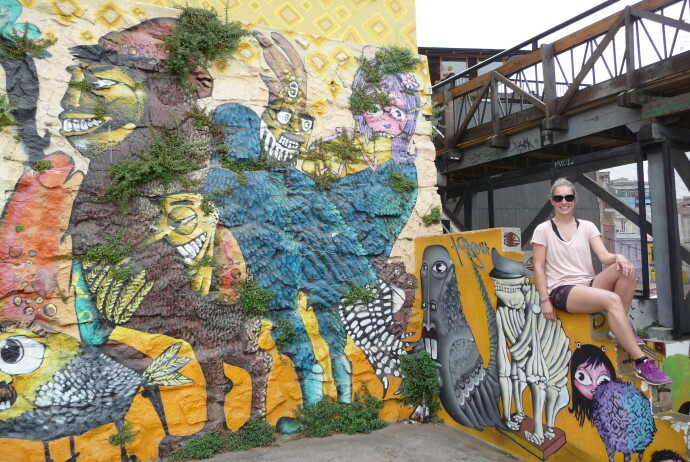 Also, we learned a lot about the omnipresent art in Valparaíso: Graffiti. Furthermore, we expanded our culinary horizon once again, when he took us to one of the best Empanada places in town – a stuffed pastry of which we prefer the fried version (we have dumped all our health consciousness by now). We also went to explore Chile’s supposedly #1 beach town (according to our guide book) – Viña del Mar. We strolled along the beach for a while and decided to like it – at least more than Valparaíso. Despite really having tried to like this place, we never found out why so many backpackers come here and sure enough we could not help but feel quite happy to board our bus to Mendoza (Argentina). Where to sleep: Hostal Tricontinental – very friendly host and safe location right across the police station. What to eat & drink: Try a “Chorrillana” – that’s Valparaíso’s most popular dish and especially great if you like onions and french fries. The healthier choice would be to dine at one of the fish restaurants in Portales and try some Ceviche – raw fish in lemon juice, and again: lots of onions. It was nice to see and read your post. Thanks for sharing with us.